The path for the Rifugio Torre di Pisa leaves from Passo Feudo. You can reach Feudo Pass by taking two lifts which leave just above Predazzo (Stalimen): first of all the bubble car to the area of Gardonè and then the chairlift to the Rifugio Passo Feudo. From Passo Feudo take path no. 516 uphill, first decisively and then more gently, across a flowering pasture. Our destination, Rifugio Torre di Pisa, can be seen immediately by looking up towards the mountain. From underneath, it looks as if it is balanced on top of a rock. During the first section you will see on the left the omeneti: classic rock cairns placed by excursionists to indicate the route in case of fog. They are very distinctive and in German they are called “stoanmandln” (stone men). Continuing uphill amongst the greenery, on the left, you can admire the Pala di Santa. The ski slopes are evident as the pastures of Pampeago with some cows grazing. On the first section we come upon stones and rocks: on the left there is a junction with path no. 22 which goes to Mayerl Alm. 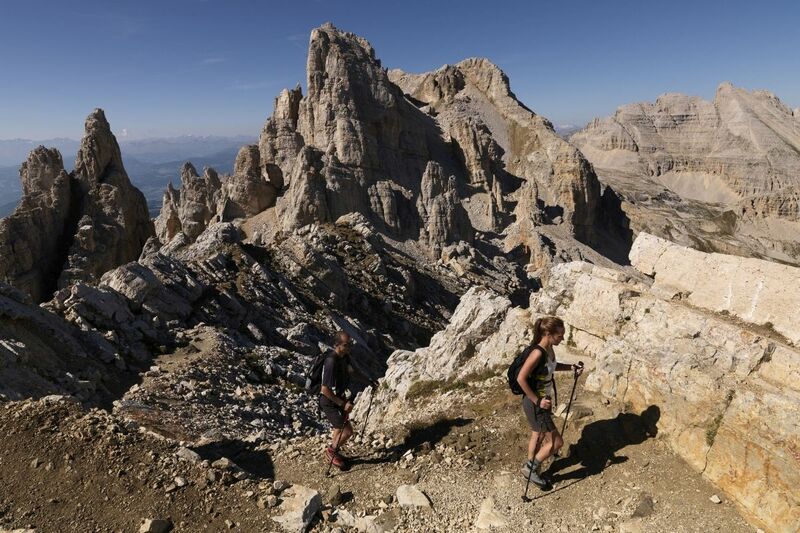 This is the Latemar Panorama, one of the itineraries of the Latemarium Dolomiti-Unesco. Ignore path no. 22 and continue walking along the path in front of you. We quickly gain height and reach a grassy saddle where we can stop to admire the view. 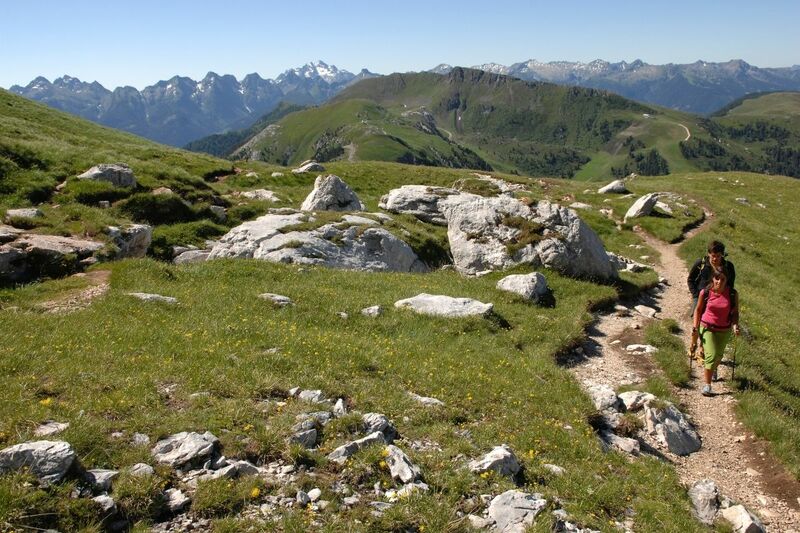 Keep going ahead on the same path which starts to zig zag between steep pastures on our right and white rocks on our left. Looking up we can see our destination much closer while on the right we can look down on the town of Predazzo. The path follows a bend to the left and comes to the base of a small scree which is easy to cross by keeping over to the left. From here the ascent is only possible over a stony and sometimes rocky path. This section is of great geological interest. In fact you will see amongst the typical white rocks that there are many very dark veins in the rock. It is porphyry, the remains of the volcanic explosion of Predazzo. During the eruption, millions of years ago, the force of the burning lava literally dug out chimneys in the Dolomite rock in order to exit. Continue on the path and within a few minutes you will reach the last large steps of rock which take you to the top, to the Rifugio Torre di Pisa (restored in the summer of 2016 and newly opened). The view enjoyed from this vantage point is absolutely breathtaking. You have a view of three hundred and sixty degrees extending from the Lagorai mountain chain, mostly porphyry, as far as the mass of granite of Cima d’Asta. The Pale di San Martino stand out on the left with their unmistakable outline. 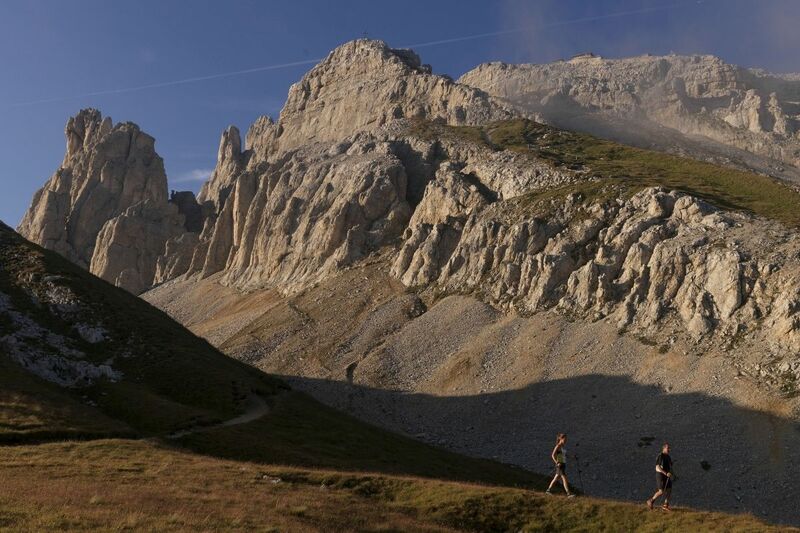 Continuing to the left, the experts will recognise Monte Civetta, Pelmo and Antelao mountains. Then you can see: Marmolada, Tofana di Mezzo, Piz Boè. While the Campanili del Latemar prevent you from seeing the Catinaccio which is just behind. 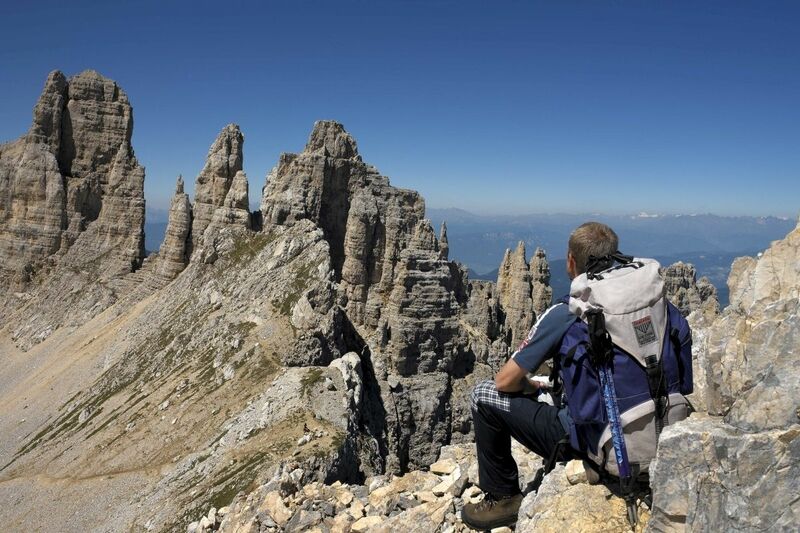 Looking to the west, we can admire in the distance the two giants of Trentino South Tyrol: the Ortler and the Cevedale mountains followed by the Brenta Dolomites, Presanella and Corno di Cavento. However we cannot ignore the famous Torre di Pisa. It doesn’t take much effort to admire it from above. From the Rifugio Torre di Pisa keep on walking along path no. 516, in the direction of the Forcella dei Camosci. 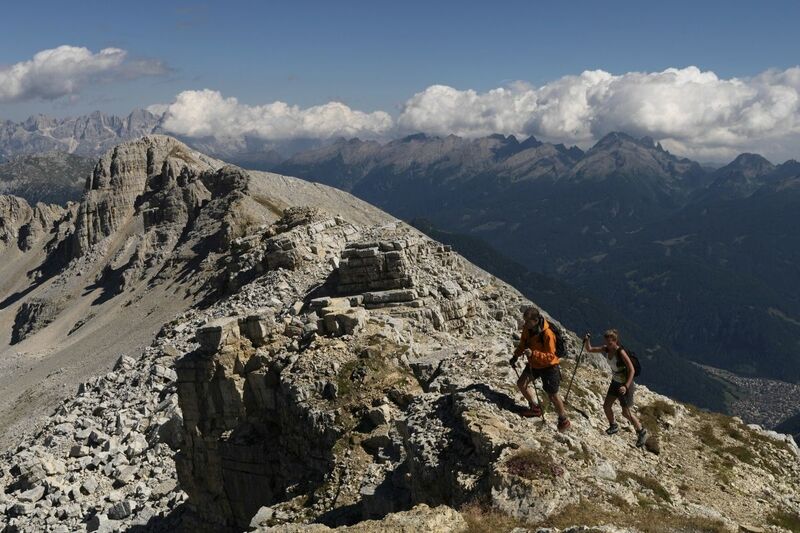 Go up a few metres behind the mountain hut and from the helicopter landing pad you will be able to enjoy an even wider view of the surrounding peaks, and above all, be able to admire westwards, the Torre di Pisa. This spire of Dolomite rock 40 metres high which will remind you of the tower of the same name (Tower of Pisa) in the Tuscan city of the same name. After having feasted your eyes on this wonderful sight you can have lunch or a snack at the Rifugio Torre di Pisa. On the way back follow the same route. Please note! You must be at Passo Feudo by 5.15 p.m. at the latest in order to catch the last chairlift (lifts close down at 5.30 p.m.).